Sumac seems to be everywhere around here. If you looked at the wood’s edge, most likely you could find a few sumac shrubs or little trees. It is a common plant, but there are a few different kinds of sumac. One is poisonous, but that occurs mostly in swamps. We don’t have that habitat up here on the mountain ridge, but we do have to keep our eyes open for poison sumac’s nasty cousin, poison ivy! The Audubon North American Field Guide to Wildflowers describes Fragrant, Poison, Smooth, Staghorn and Winged Sumac in Eastern North America. Smooth, Poison and Fragrant Sumac all have smooth twigs. 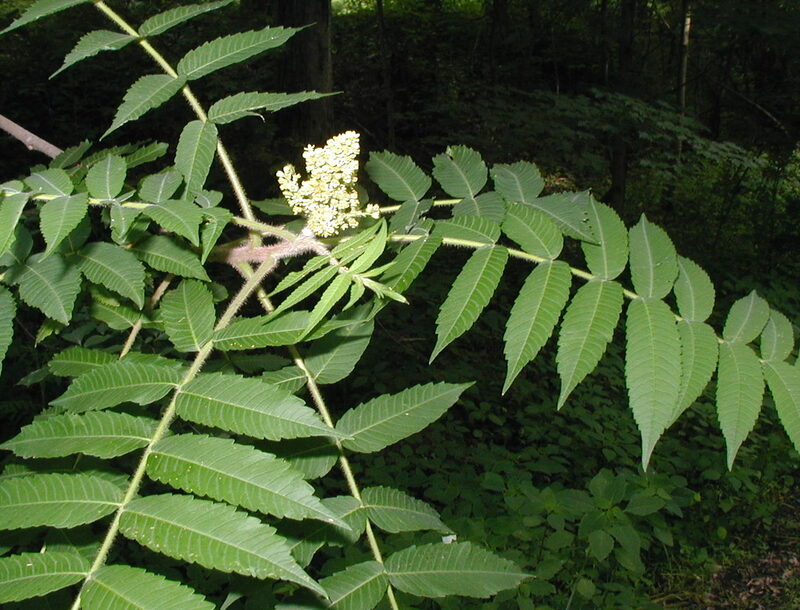 To be sure, Poison Sumac leaflets are not toothed and its berries are white. 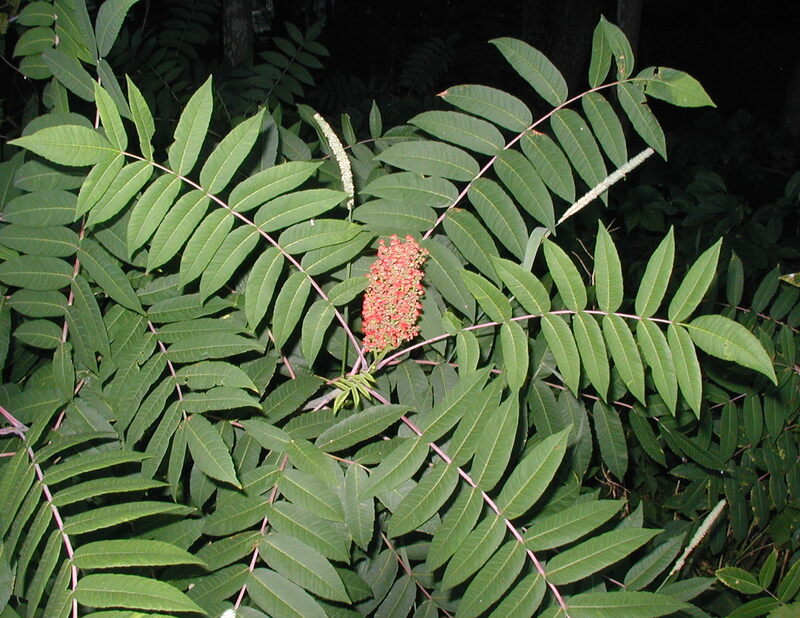 Fragrant Sumac, Rhus aromatica, is a little different in appearance as it only has three leaflets to its compound leaves, where the other sumacs have many more leaflets, like 9 to 31 leaflets. 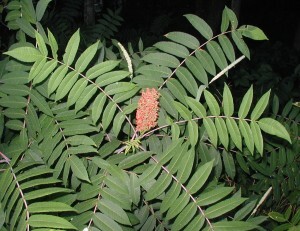 Smooth sumac berry cluster and several leaves with many untoothed leaflets. 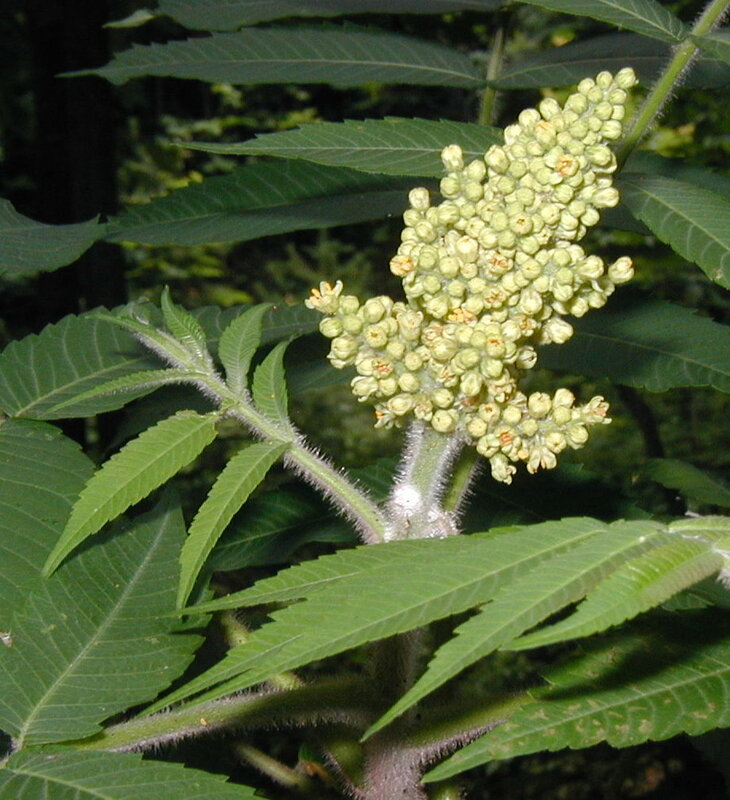 Winged Sumac can be differentiated from Staghorn Sumac by the presence of a winged midrib between the leaflets of its pinnately compound leaves. 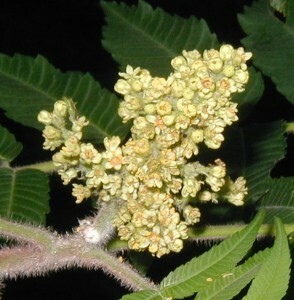 Leaflets are untoothed in Winged Sumac. Staghorn Sumac, Rhus typhina, seems to be the primary species of Sumac in our area. Characteristics that mark this sumac are its hairy twigs, toothed leaflets, and reddish hairs on berry-like fruits. Flowers are green in terminal clusters. Compound leaves of Staghorn Sumac with many pairs of toothed leaflets. Cluster of green flowers and hairy twigs of Staghorn Sumac. Flowers are just beginning to open. Another view of Staghorn Sumac blooming. Photos above taken 6 June 2010. A type of pink lemonade can be made from the ripe red berries of Staghorn Sumac in the summertime. Peterson’s Edible Plant Guide says to bruise the berries, soak for 15 minutes in cold water, strain out the hairs and berries with cheesecloth, sweeten and chill. Does anyone out there feel adventurous enough to try sumac lemonade? Let us know how you make out! When I was young, my father used to make a summer time drink from the red seed pod. It was quite good. He also used the pods in his bee smoker before he would open the hive. Was it a lemonade kind of drink? How interesting about using in the bee smoker! I wonder if others used sumac that way – was it to get rid of mites?